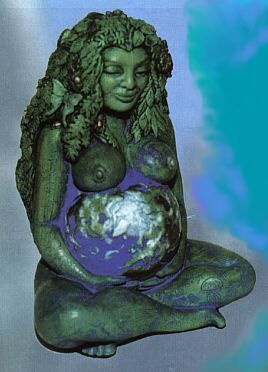 In Greek mythology, Gaia is the Earth goddess, the personification of the Earth; the goddess of the land and everything produced by it. The "deep-breasted," the first being to emerge from Chaos. (The primordial void that existed before order became imposed on the universe and from which all created things proceeded, including the gods. Chaos had several children with himself, such as Erebus and Nyx as well as Eros and Gaia). She was creatrix of the universe, the first race of gods, and mankind. She gave birth to Uranus, the sky, and Pontus, the sea. She then mated with her son Uranus to produce the 12 Titans, the Cyclops and finally three monsters. Uranus, horrified at his offspring, shut them in the depths of the earth. Gaia, infuriated, persuaded her youngest male Titan, Cronus, to castrate Uranus as he slept beside her. The blood dripping on the earth gave birth to Erinyes, to giants and to the ash-tree nymphs the Meliae. The blood dripping on the water gave birth to Aphrodite. The Oracle of Delphi, before it passed to Apollo, belonged to Gaia, who was preeminent among prophetesses. She presided over marriages, was invoked in oaths, and was offered the first of fruits and grains. In 1975, two scientists (Lovelock and Epton) published the outline for the Gaia Hypothesis. Lovelock later wrote the book, "Gaia: A New Look at Life on Earth." This scientific hypothesis was based on 2 premises: Life exists only because material conditions on Earth happen to be just right for its existence; and, Life defines the material conditions needed for its survival and makes sure they are there. In essence, they are saying that the whole system -- Earth and its biosphere -- exhibit the behavior of a single organism, a living creature. They called this creature Gaia (after the Greek goddess). The Earth, then, by human experience, occult theory and *scientific fact*, is a living entity. Humans are the central nervous system, the rivers are the bloodstream, the tropical rainforests are her lungs, other systems are other organs; all work in concert with one another as a whole. There are so many other variables to this equation. I recommend Lovelock's book. It's fascinating reading, and I think you'll find it very readable (in a scientific sort of way). Environmentalists have often invoked Gaia during environmental actions. To many, Gaia is the spirit behind all such actions. She exemplifies the earth as a living entity. As such, she infuses these acts of reclaiming with the divine. Recently, then, she has been given a new face -- that of all we must preserve, reclaim, create. We need her to survive. She is the cycles, the seasons, the regeneration. She is that which is within us which spurs us to acts of right livelihood. (Like composting, recycling, using public transportation) Read Starhawk's "Dreaming the Dark." I promise you'll become an activist after reading it, and you'll understand that taking a stand for the earth is a witch's responsibility. My experience with Gaia? She was with me on every march, at every rally. She goes with each bus to the Nevada nuclear testing site. She is with activists who raid the Hanford Nuclear Power Plant, and with the witches as they weave their magick at the entrance to the Oak Ridge nuclear plant (picture 3 witches in robes on Samhain banishing the use of nuclear weapons). She sits with the treehuggers in the tops of trees in Oregon and she empowered protesters at the Champion paper mill in North Carolina. She witnesses all. She empowers all. She is our breath.